You might receive a LinkedIn introduction request that you just don’t feel comfortable sending to the recipient. Perhaps you don’t know enough about your contact who made the request, or you’re unclear about that person’s true motivations. Or maybe your connection with the recipient isn’t at the stage where you feel you can introduce other people to this person. It’s not you. The most common way to decline is to simply inform the initial contact that you’re not that deeply connected with the intended recipient, and you really don’t feel comfortable passing on a request to someone who isn’t a strong contact. Often, you might have first-degree connections in your network who are “weak links” or people with whom you’re acquainted but aren’t particularly close to. The recipient doesn’t respond well to this approach. You can respond that you know the intended recipient, and you know what she’s going to say, either from past requests or other experiences with that person. Because you know or feel that the intended recipient wouldn’t be interested, you would rather not waste anyone’s time in sending the request. You’re not comfortable passing along the request. Be honest and simply state that you don’t feel right passing on the request you’ve received. After all, if the original contact doesn’t understand your hesitation, he’ll probably keep asking, and LinkedIn will want you to follow up on any unresolved introduction. Just as in life, honesty is usually the best policy. Your request needs work. Because you’re vouching for this person, you don’t want to pass along a shoddy or questionable request that could reflect badly on you. In this case, simply respond that you think the request needs to be reworded or clarified, and offer concrete suggestions on what should be said as well as what requests you feel comfortable forwarding. Click the Messages button in the top navigation bar, then click the drop-down arrow next to All Messages and select Introductions from the list. This should bring up the list of introductions in your Inbox. If you receive copies of introductions in your e-mail and then click the link from the e-mail message, you’ve already completed Step 2. Click the subject line of the introduction request. You see the introduction request. Click the Decline button at the bottom of the request. The Not Interested in Forwarding page appears. 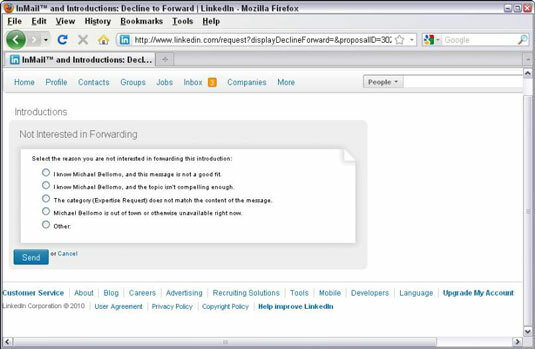 Pick a reason for not forwarding the request, or select the Other option and write a message why you’re declining to forward. If you pick any of the main options, like “I know X, and this message is not a good fit,” you don’t have to provide any additional message. Unless one of these options really states your case, you should probably select Other and write a custom message (or send a separate e-mail message giving more information). Click the Send button to decline the request. The original contact receives an e-mail as well as a message in his LinkedIn Inbox.